Butter a 20cm non-stick springform tin and dust with polenta. Put a disc of greaseproof paper in the bottom and butter that. Cream the butter, add the sugar and beat well. Beat in the eggs gradually, then add the zest and juice. Now beat in the ground almonds, polenta, and the baking powder. Spoon the cake mixture into the prepared tin, spread it evenly and cook in a 170C/150C fan oven for about an hour, maybe a little more - until a skewer inserted into the centre of the cake comes out clean. 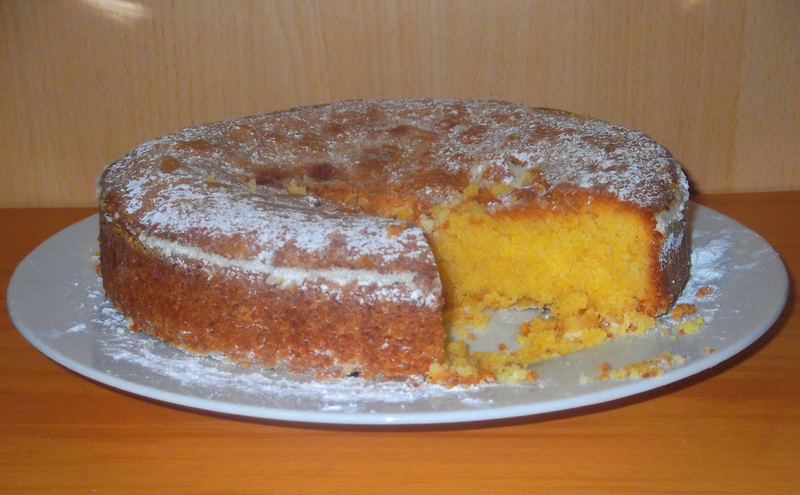 Remove the cake from the oven when it is cooked, and let it cool in the tin for about 10 minutes before removing it. Dust the top of the cake with a little sifted icing sugar.